IWAKI: KUNISADA moved with KUNISUKE to OSAKA. O-NOTARE MIDARE with TOBI, and TORAN-MIDARE with ASHI. Profuse NIE. OSAKA BOSHI (MARU) and OSAKA YAKIDASHI. SADANORI ENPO: From HIGO, he studied with SHINKAI in OSAKA. GISAN: OSHU HANSHU Lord of the Province hobby maker. 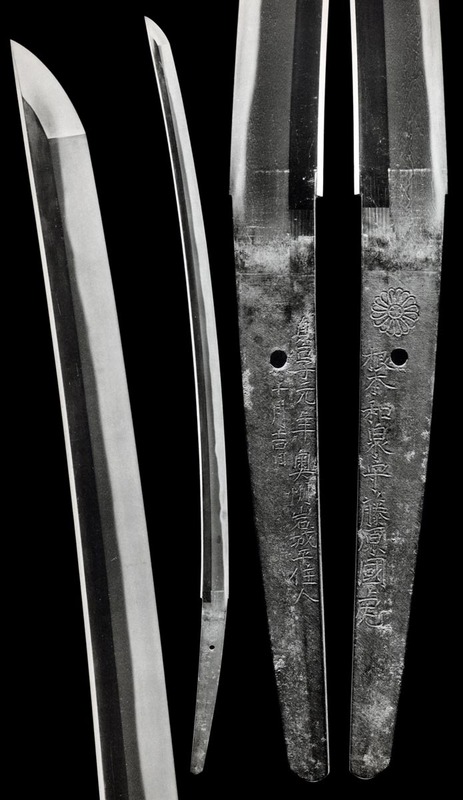 Shinogi-Tsukuri, Ihori-Mune, Sakizori of shallow curve Chu-Kissaki. Very tight Ko-Itame Hada with Masame in the Shinogi-Ji. 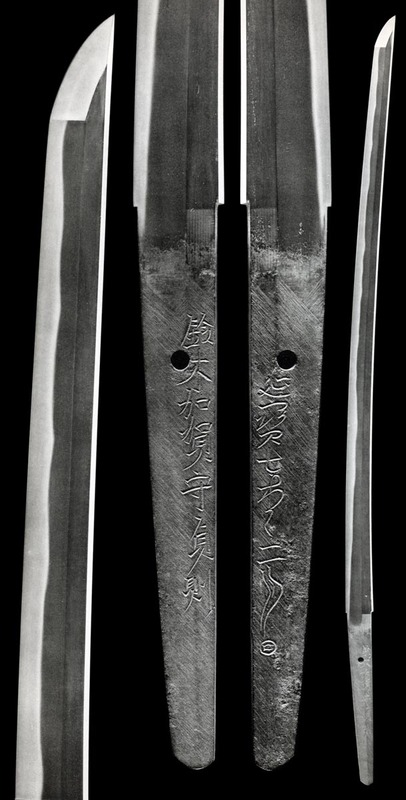 Asaki-Notare in Nioi-Fukashi and Nie. Shinogi-Tsukuri, Ihori-Mune, wide Mihaba to broad, elongated Chu-Kissaki. Itame Hada becomes strongly Mokume in Moto wher Chikei is seen. Ji-Nie abounds. Hiro-Sugu Asaki-Notare fills the upper and gently narrows in a gradual slope. 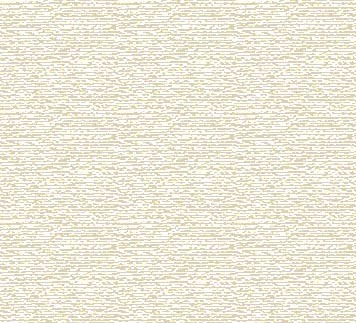 Nioi-Fukashi and Nie hide Gunome-Midare Ba within. Deep Saagari Boshi has Ko-Maru and a long-falling Fukashi Kaeri. Ubu, Haagari Kurijiri Nakago has one Mekugi-ana. Sixteen Petal Kikumon with five-petal bud.